Fundamentals of Forensic DNA Typing is written with a broad viewpoint. It examines the methods of current forensic DNA typing, focusing on short tandem repeats (STRs). It encompasses current forensic DNA analysis methods, as well as biology, technology and genetic interpretation. This book reviews the methods of forensic DNA testing used in the first two decades since early 1980’s, and it offers perspectives on future trends in this field, including new genetic markers and new technologies. Furthermore, it explains the process of DNA testing from collection of samples through DNA extraction, DNA quantitation, DNA amplification, and statistical interpretation. The book also discusses DNA databases, which play an important role in law enforcement investigations. In addition, there is a discussion about ethical concerns in retaining DNA profiles and the issues involved when people use a database to search for close relatives. Students of forensic DNA analysis, forensic scientists, and members of the law enforcement and legal professions who want to know more about STR typing will find this book invaluable. Undergraduate forensic science students, lawyers who need enough cursory information to understand and speak to jury, law enforcement, crime scene investigators, legal professionals and government/legal policy makers. John M. Butler is a NIST Fellow and Special Assistant to the Director for Forensic Science, Office of Special Programs, at the U.S. National Institute of Standards and Technology, in Gaithersburg, Maryland. Dr. Butler earned his PhD from the University of Virginia while doing DNA research in the FBI Laboratory's Forensic Science Research Unit. He has won numerous scientific awards, including being named Science Watch’s #1 world-wide high-impact author in legal medicine and forensic science over the last decade (July 2011). He has over 150 publications in this field and is a frequent presenter on the topic of DNA typing, and has authored four other DNA Typing books including Advanced Topics in Forensic DNA Typing: Methodology. For a detailed CV, visit http://www.cstl.nist.gov/strbase/butler.htm. "There is perhaps no individual better suited to author a foundational survey of forensic DNA typing than John Butler. 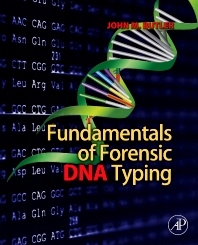 As with past editions, Butler’s knowledge, along with his organizational and communication skills make Fundamentals of Forensic DNA Typing a must read for students, forensic practitioners and trial attorneys. This text provides the reader with insightful and understandable explanations necessary to comprehend the underpinnings of forensic DNA analysis. It continues in the tradition of its predecessors as the premier textbook on the forensic DNA subject."